You can get issues #0-2 here! 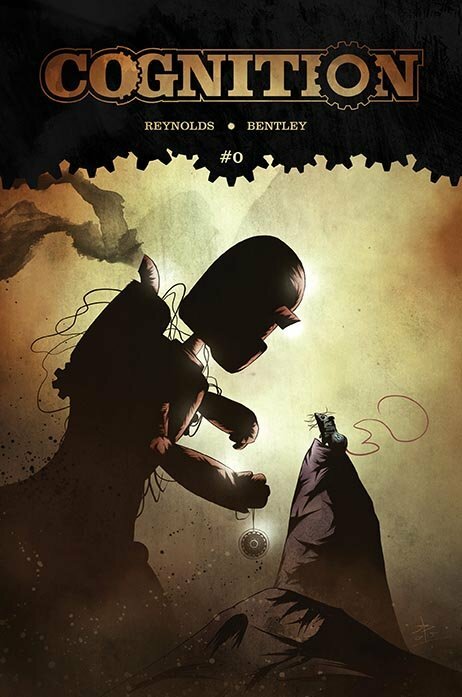 Cognition #0 is a 34 page, black & white, single issue comic that follows the exploits of a steam-powered automaton inhabited by a human spirit called Cal and a demonically possessed mouse named Sigma. They battle spirits, monsters and folkloric nasties for the British Occult Secret Service (BOSS) during the ‘Golden Age’ of the Victorian era. Issue #0 contains 3 short stories that introduce the main characters, their world and the supernatural laws that govern them. They Never See it Coming – The BOSS team run sting operations, looking to expose fake spiritualist mediums. The trouble starts when they stumble over the real deal. The Devil’s Fishing Hole – Cal & Sigma investigate when a number of people go missing on Hackney marshes. They get more than they bargained for when they discover truth. Frame Breakers – A dangerous group of radicals plot the downfall of the British Empire. A dangerous enemy is revealed. Included in the issue is the BOSS Personnel File, which gives a bit more information about our heroes and a special pin-up gallery from guest artists. The first story really sets the tone, the art and story style really gel. I like the set up and it really brings us into the world of the occult – the real and the fake! I like the background commentary too, as this adds a different level. The black and white style and the inking work really well. the Devil’s fishing hole gives us more of the background of the world, and why these things happen. I liked the factoids about Whisps and demons, and the reasoning for the disappearances. This story has more action than the last, with a message being sent. The further information about Sigma is very interesting too! The final story gives us a look at the enemy – and their reasons! I like the setting of this, and the final page is really good, the crack about the ears is very good…..
finally we get a selection of artwork from a variety of artists! 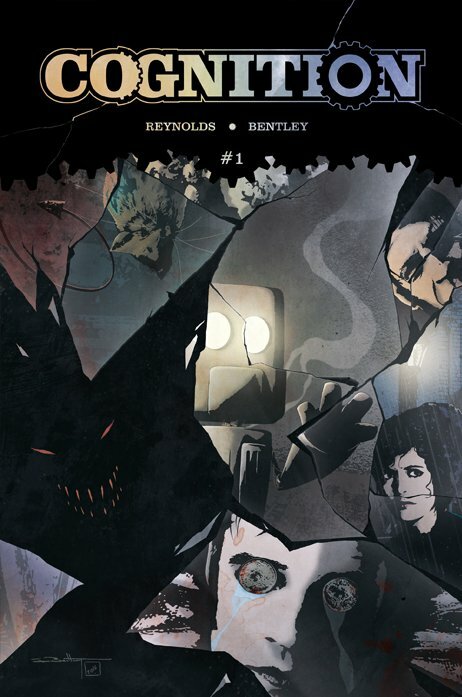 Issue #1 is the first long form COGNITION story. After introducing the characters and their world in the #0 issue, we get to see the team swing into action battling a malevolent demon for the possession of an innocent soul. Also includes the 4 page short ‘What the Butler Saw’ & pin-up gallery. I must say, I do enjoy the banter between Sigma and Cal, it really adds to the commentary! This longer story features a gruesome murder mystery. The culprit has been caught and punished for his crimes, but there is something more underneath it all. Cal and Sigma really make this issue as Sigma gets a bit more an insight into human affairs while Cal learns more about demons – the part about the coins was especially good! The finish was especially dark and interesting and this look into demonkind was very well done. It gave some closure, as well as some pointers towards the future of this series. The back up story gives us a little view ‘below stairs’ and it’s gives an outsiders view of the inside. The script works really well and ended with a smile. Also some more pin-up art, these are excellent! 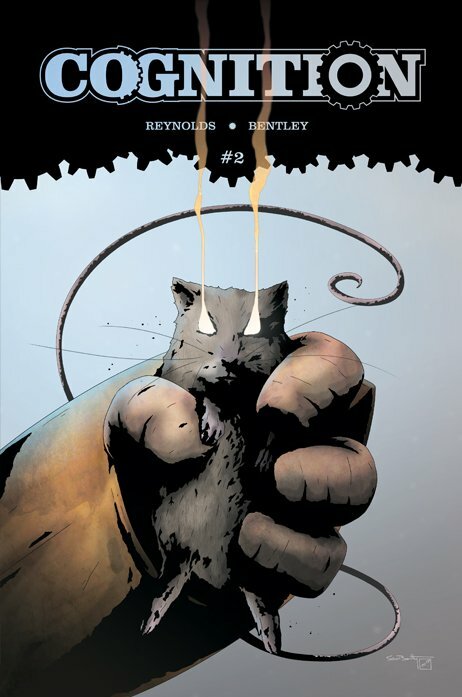 Issue #2 is our second long form COGNITION story and begins the meat of our first story arc in earnest. The BOSS team are visiting Norfolk in search of the legendary demon dog know locally as ‘Black Shuck’. What they find will propel them into an adventure into myth and occult powers beyond their understanding. Also includes the 4 page short ‘Whisper into the Void’ & pin-up gallery. This has to be my favourite cover! Black Shuck is an interesting legend, and the beginning of this issue gives a quick look at it! Sigma allows us a look at the rest of the team, well kind of, as Pope is a bit different to the rest….. The back up story gives us a look into the mind of a medium and the problems she has – carrying her demons. Again there is some excellent back up art!